Beetroot and I have a hate hate relationship and the hating part solely lies with me. In this matter, no one can blame the beetroot when it selflessly imparts such gorgeous reddish hue to any dish, even to my not so appreciating teenage fingers when I used to cut them for my mom. The only dish that I can fathom with beetroot in it would be the vegetable chop but in curries???? Forget about it. Maa: To dinner banie felechis (So, have you prepared dinner?). Me: na just roasted some vegetables, baked a bread and will make the soup just before serving. Me: beeter er soup Maa (beetroot soup maa). Me: yes maa. Why can’t I change? Am all grown up now and know how good it is for our diet. Maa: I know but you and beetroot soup? Me: Yes maa and it tastes really good. Trust me. Me: oh! Forget about it. lets talk something else. 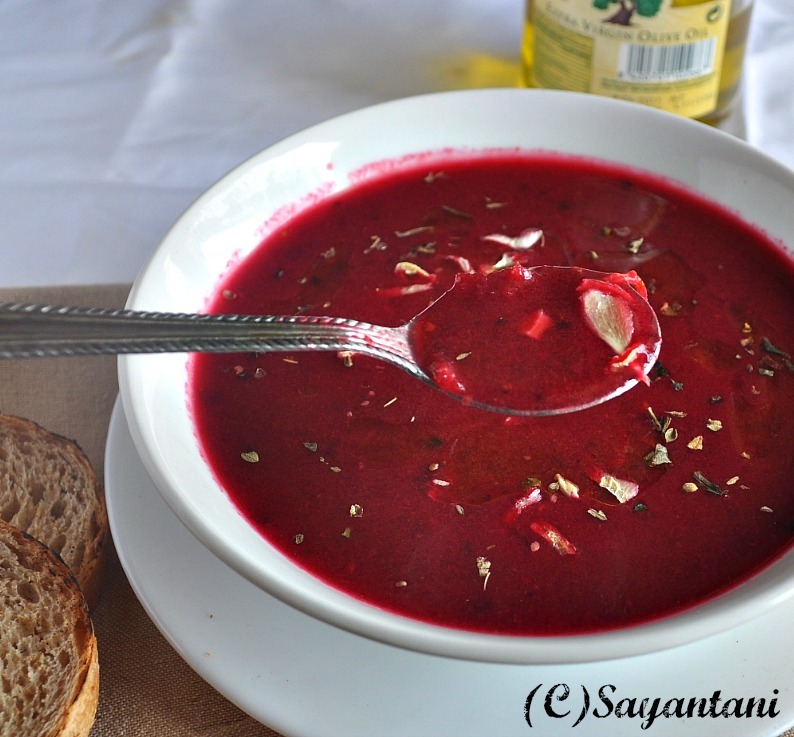 Maa: did you say beetroot soup as beet as a main ingredient or you are just throwing few pieces with other vegetables? Me: Maa why are you fussing so much it’s a beetroot soup with only beet and 2-3 other ingredients. Maa: arektu kichu banie rakhis, jodi khete na paris. Toke to chini. (Make something else also I know you might not be able to have it). So there you go, even my mother could not believe that my taste can develop for this vegetable. and to be true even am not assured that it has, but definitely I have matured as a person to try everything. As a fact when I introspected the reason of not liking this vegetable I realized that its not the taste rather the woody earthy smell that I do not like and roasting it takes away that unpleasant smell. Seems a perfect solution to our relationship. so this definitely goes to the list of recipes which I like with beetroot in them. And with confidence I can conclude now that beetroot and I now have a love hate relationship. 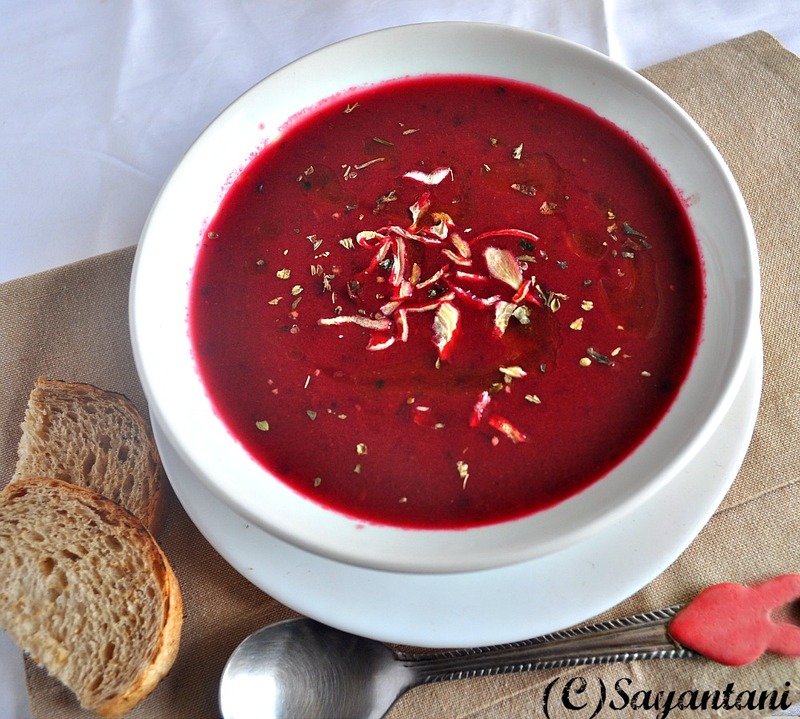 This recipe is inspired from Lakshmi’s Beetroot soup. I say inspired because I made many changes to suite our palette and also to suit the availability of ingredients. I made it thrice since the conversation with mom and we liked it every time. First time I used some homemade sun dried tomato but other times roasted tomatoes along with the veggies and it worked just equally good. Here is my recipe for it. Peel and cut the potato and beetroots in julienne. Cut each tomato in 8 wedges. Pre-heat the oven to 220 C and line a baking tray with aluminium foil. Grease and place the vegetables in single layer. Sprinkle salt, 1 tbsp olive oil and little oregano. Roast for 20-25 minutes till they are cooked and the outer surface looks dry and crinkled. Blend this with stock cube and 2 cups water. You need to do this in batches. Mix 2 more cups of water and Keep aside. Place a pan on fire. Add olive oil. Crush the pepper coarsely and add. Add a pinch of oregano, Stir for 10 seconds and then pour in the blended vegetables. On medium flame bring it to a boil. Add the rest of the oregano, dehydrated onion. Adjust salt. Cook for 2-3 minutes. Switch off. Add lemon juice, adjust taste and Serve hot with toasted bread. to make soup stock at home cut 1 big carrot, 1 thick stalk of celery, 1 medium onion in cubes or slices. Chop 2 fat cloves of garlic. heat 1 tsp olive oil in a thick bottom pan. Add 1 bay leaf, 1/2 tsp freshly crushed peppercorn, garlic and onion. saute for 3 minutes and then add all other vegetables. add salt and cook on medium high for 6-7 minutes. add 4 cups water. cover and simmer this for 15-20 minutes. strain the stock and use. you can also add capsicum, mushroom, cabbage, broccoli etc to add more flavour to it. you can also pressure cook the entire thing but make sure you have a bigger cooker to hold all the water. or add 2 cups of water, pressure cook and then add 2 more cups water and bring to a boil. (I never tried this method though). If you make soup stock at home then do not discard the veggies rather make this baked chops. looks yum, will definitely try this healthy recipe. Any substitute for stalk cubes, as we dont use them. @Lavina, updated the post please check. I am a convert... initially I never used to like beet but now things have changed. Lovely Soup and the conversation between you n yr mom was really sweet. Filling and yum soup,absolutely love the color. I love beetroot and so does my son. I must try making this...And moms, they know us too well, right ? Very colourful flavourful and healthy soup. Khub attractive dekhte hoyeche. Such a catchy,terrific,hearty and healthy soup. opening in I.E., it's got some overlapping issues. I merely wanted to give you a quick heads up! Besides that, great blog! Beet root and I had hate hate relationship in college. but now i love it not so the rest of my family. so when i saw this i am tempted to make it just for myself. A very interesting way to have beetroot..will love to try it sometime. Loved the beautiful color of soup...Looks yummy.. The first time I made beet soup, my husband reacted with a raised eyebrow and said ' pink soup '?! LOL LOL. Thankfully he ate it and he liked it ! First time here. 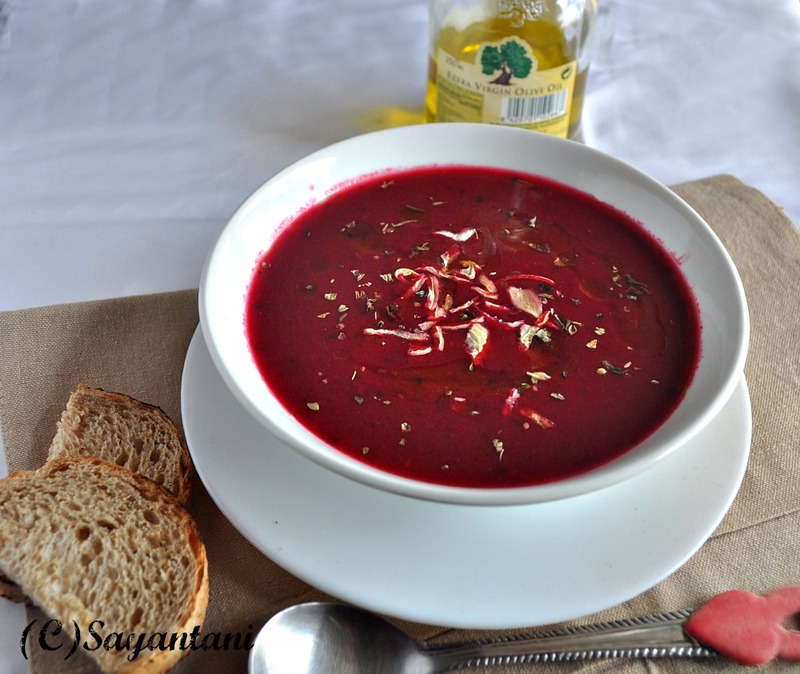 Roasted beet root soup is so delicious. Thank you.